Back in my magazine editor days I worked on a travel essay about Amsterdam. My girls were young at that point — probably four and five — and I remember the writer talking about what an impression the city made on her when she was a kid. That it was magical, that it was like living inside a dollhouse, and that it was the first time she had that “otherworldly, faraway” feeling you get when you travel somewhere new. Having just returned (it was my first time, too) I can say it delivered on all counts. (Not to mention the Fault in Our Stars count — the girls, of course, made a pilgrimage to “the bench.”) We’ve been back almost a week and when I scroll through these pics, even I wonder if it was all just a dream. I thought you’d like to hear a little about the trip. There are a lot of photos in this post, but the one you are looking at here is probably the only one that really gets to the heart of what we did all day, all week. We walked. And walked. And walked. 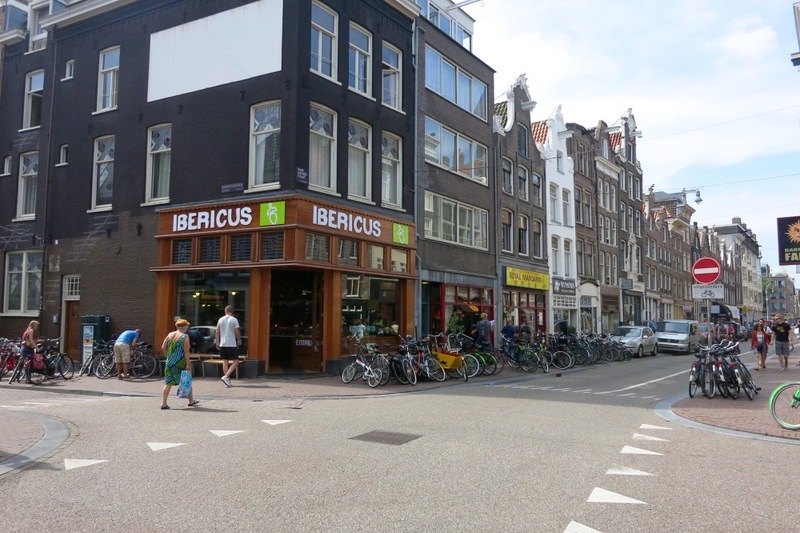 And as anyone who has been to Amsterdam knows, this city was made for walking. 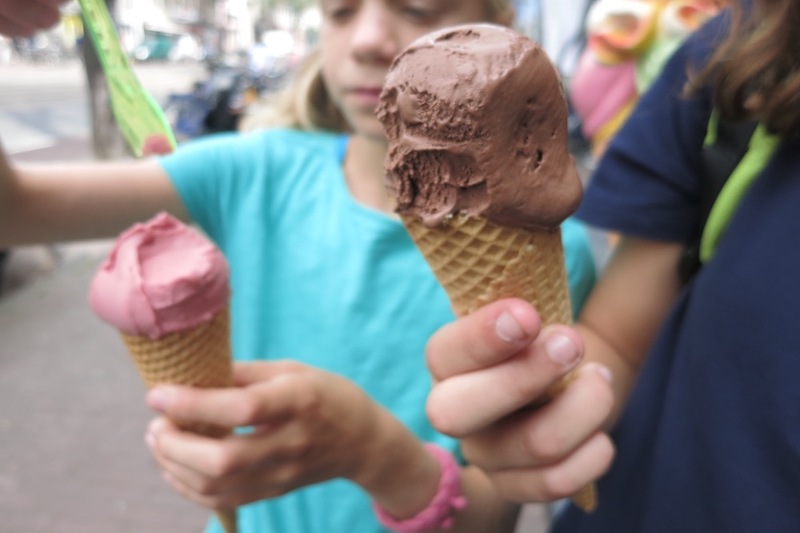 Our favorite neighborhood for wandering was Jordaan — we somehow always found ourselves on or around Prinsengracht — but we logged miles all over town (more on that below) fueling up with treats and meals along the way. Phoebe got really into a health app on her phone that tracks how many steps you take in a day (sort of like the FitBit) and one day she announced we got to 28,000 steps. I think that’s a family record. 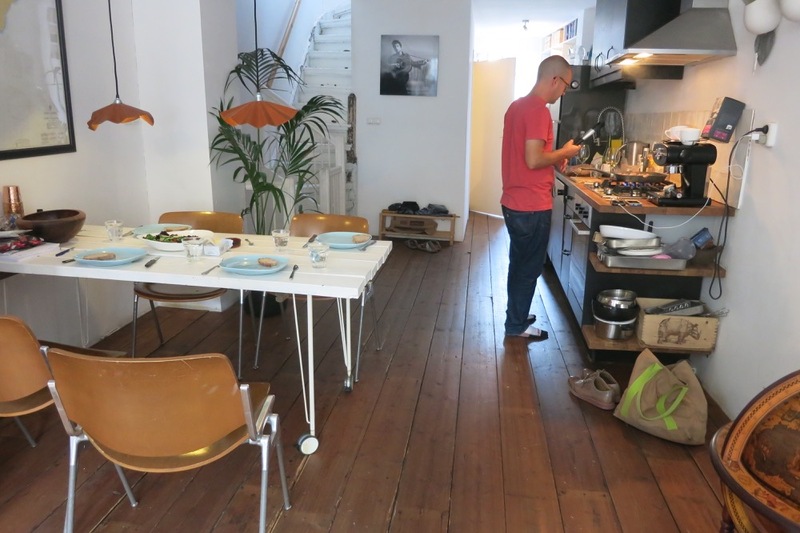 Here’s Andy putting together one of those dinners in our cute loft-like kitchen. We made salmon with yogurt-mustard-dill sauce, a recipe that has been in the arsenal forever (it’s in Dinner: A Love Story), and that somehow never gets old. 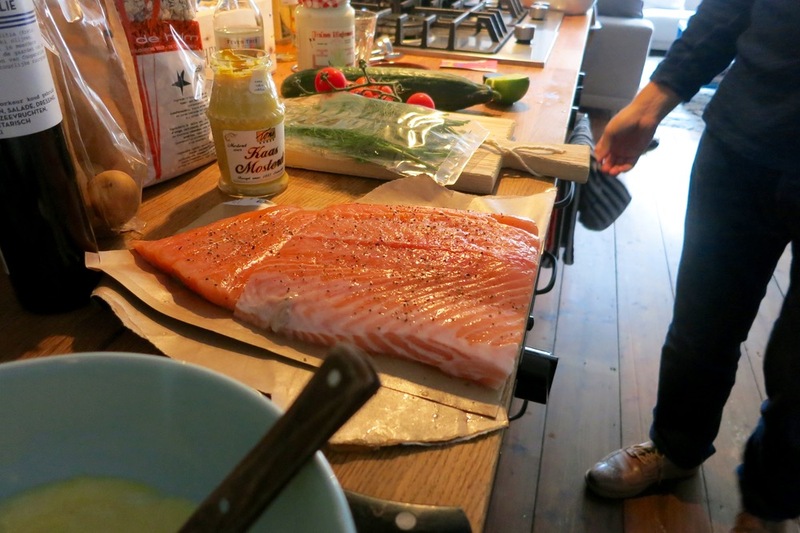 Especially on vacation when we have access to decent salmon (as we did in Amsterdam). You can grill or roast at 400°F for 15 minutes (brush with olive oil, s & p) and while it roasts, whisk together plain yogurt with a little Dijon, fresh dill, salt and pepper. I love it because it doesn’t involve buying a hundred things you’re going to throw away in the next week. It wasn’t all cooking in. We did the requisite Indonesian rice bowls at a place called Tempo Doeloe right in our neighborhood (reservations essential) and another night, at a friend’s recommendation, we hit Lucius, a fish restaurant, on Spuisstraat. 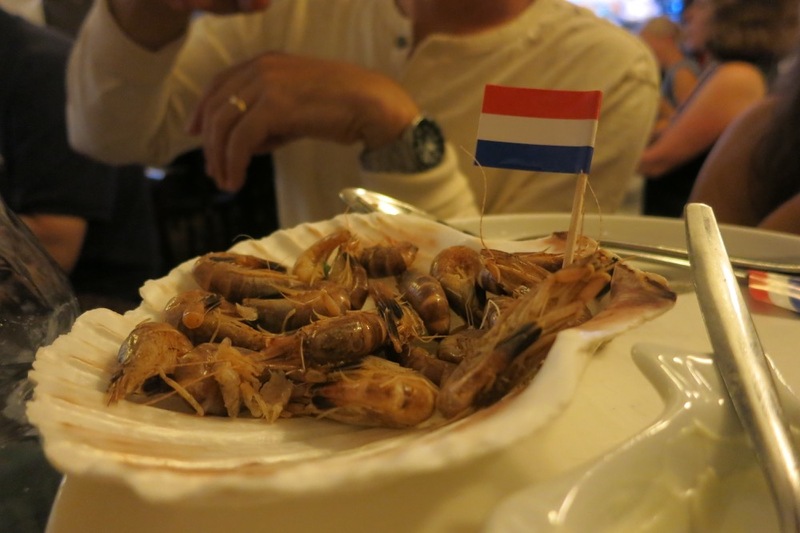 They specialized in fish and we went off on these peel-and-eat Dutch shrimp. They were teeny-tiny, but yielded the most flavorful bites. Here’s a happy social media story for you: About two days into the trip, I posted a photo from Amsterdam on instagram and a follower (who lived on the actual street where the shot was taken) responded with this nice message: “I live here! 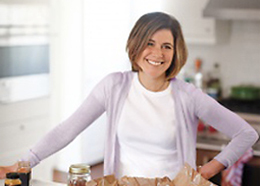 Can I help you with recommendations for food or things to do? !” (How nice are people?) 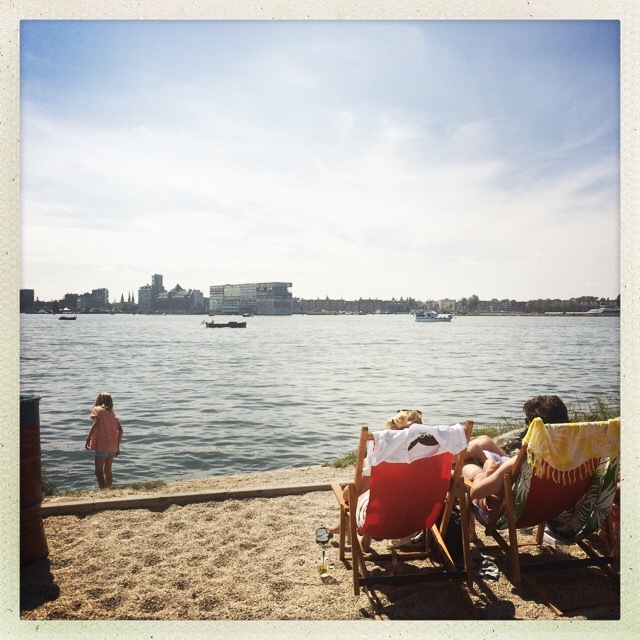 She told us to take the NDSM Werf ferry (free, behind Amsterdam Centraal Station) to check out the industrial artist community and urban beach temporarily set up across the bay. And while we were there we should definitely have lunch at Cafe Pllek, which is what you’re looking at above. We do as we are told! Thank you @jaertsams!! As to be expected, our walks were fueled all along the way by treats. 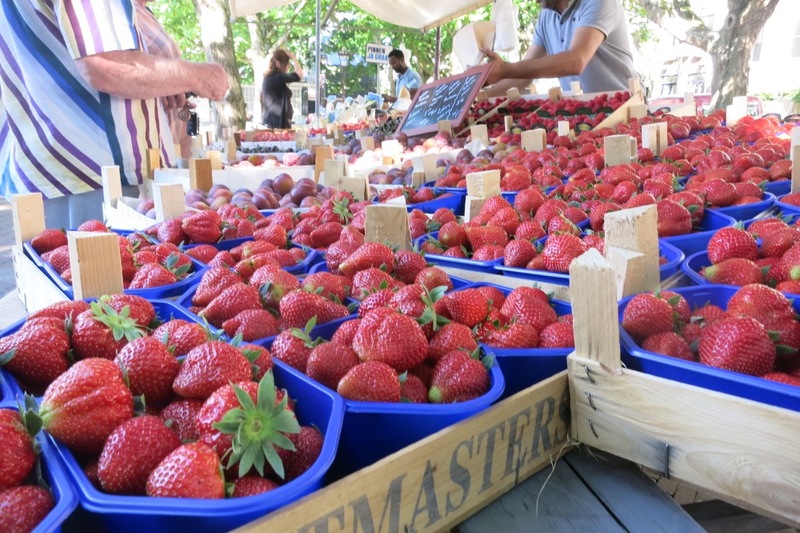 We grabbed strawberries at a market set up in a square between Prinsengracht and Kerkstraat…. We must’ve gone to Yscuypje (Prinsengracht and Wolvenstraat) a hundred times. One night after dinner we decided to walk two miles for dessert at Winkel. 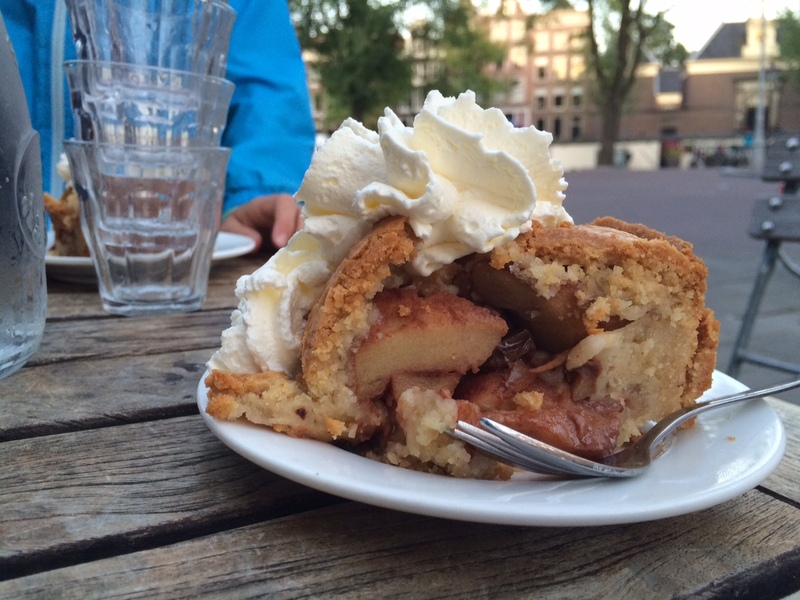 When we showed up, the waitress asked, “Apple cake, right?” (How did she know?) I guess it’s a thing. And P.S. Everyone speaks perfect English. It’s really incredible. Another great suggestion from my instagram friend: We walked the entire length of Haarlemmerdijk and Haarlemmerstraat where there were (in her words) “tons of foodie specialty stores: jambon iberico, olive oil, jewish bakeries, arab butchers, portugese snacks, tapas, kitchen equipment, etc.” For a morning snack, we split the world’s greatest iberico ham sandwich from this store you see above. 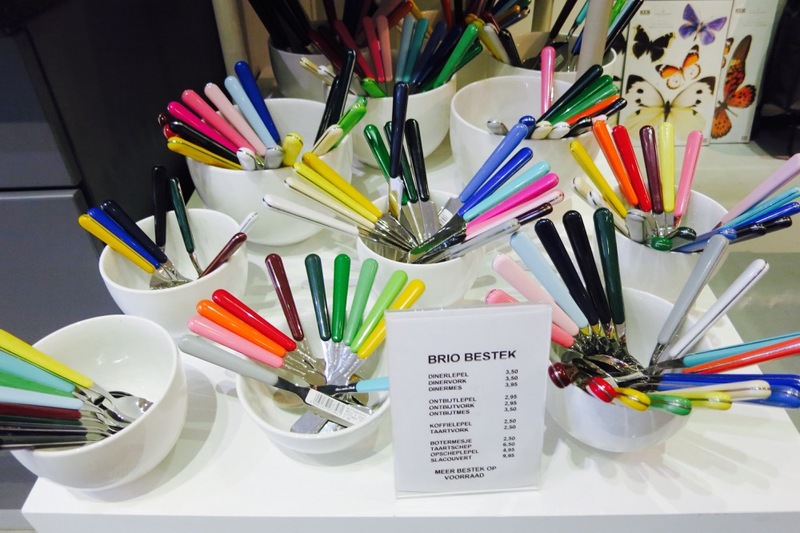 There were also tons of design stores along Haarlemerdijk. A place called Klevering was my favorite. 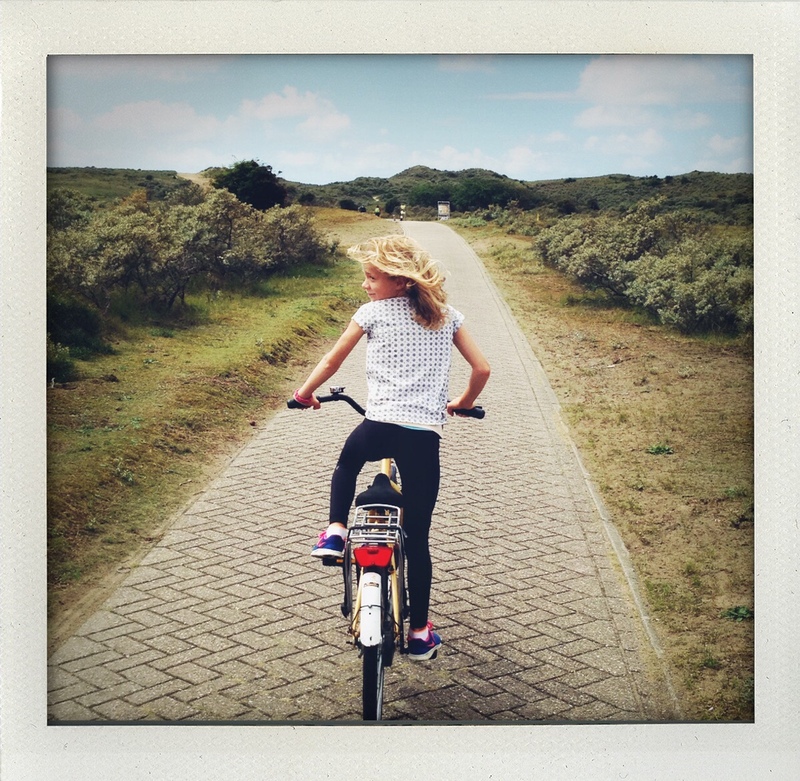 For a day trip, we took a twenty-minute commuter train to Haarlem, which was like a mini Amsterdam, complete with canals and medieval churches, and rode our bikes through the national park to the beach on the North Shore. The biking in Amsterdam proper was a little intense for the girls, but here, off the grid a bit, we felt better about it. We rented bikes right outside the train station at a place called Rent-a-Bike, and then spent the day exploring. Gorgeous. Note to self: Next time book Anne Frank House tickets waaaaay in advance. We lasted on line about a half hour before we heard that there was still three hours to go. (Please see tip in comments for how do address this if you find yourself in a similar situation.) 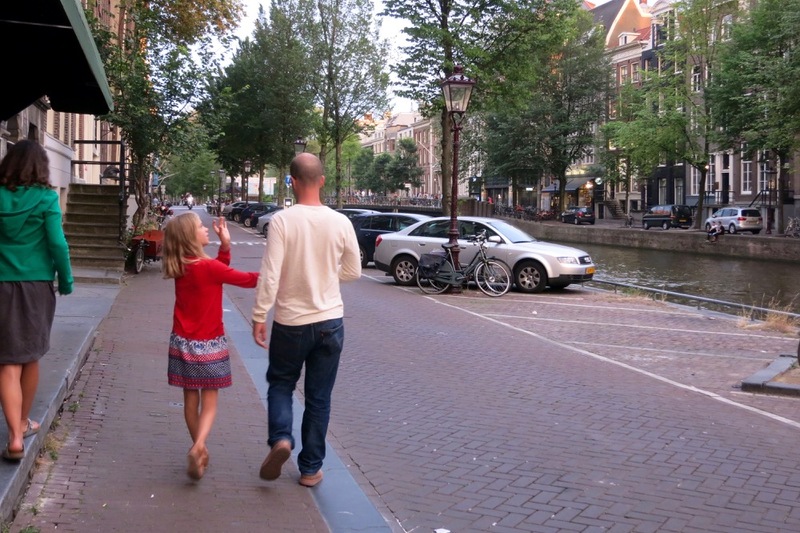 We did, however manage to hit the Van Gogh museum, and as far as vacations with kids go, I think one museum every eleven days is just about the right ratio. Thank you Amsterdam. We already miss you! P.S. 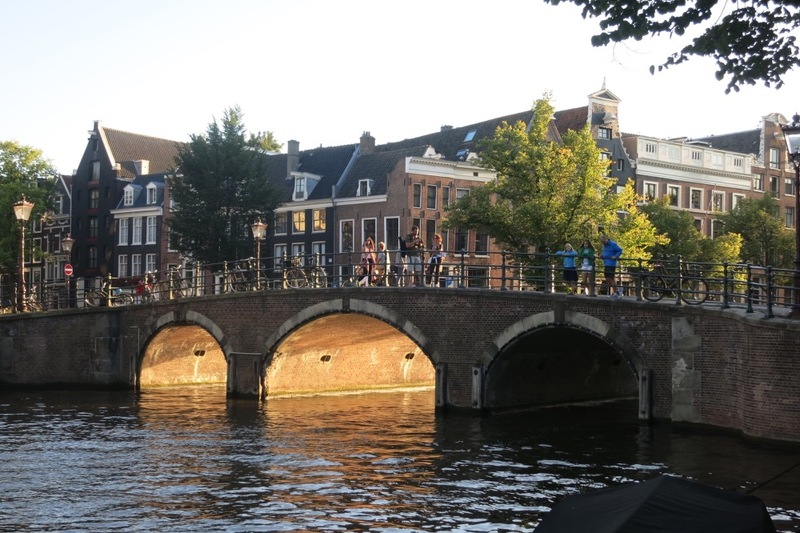 As always, please feel free to suggest things we missed (there was a lot, I’m sure) so that future Amsterdam family travelers can use this page as a comprehensive resource. 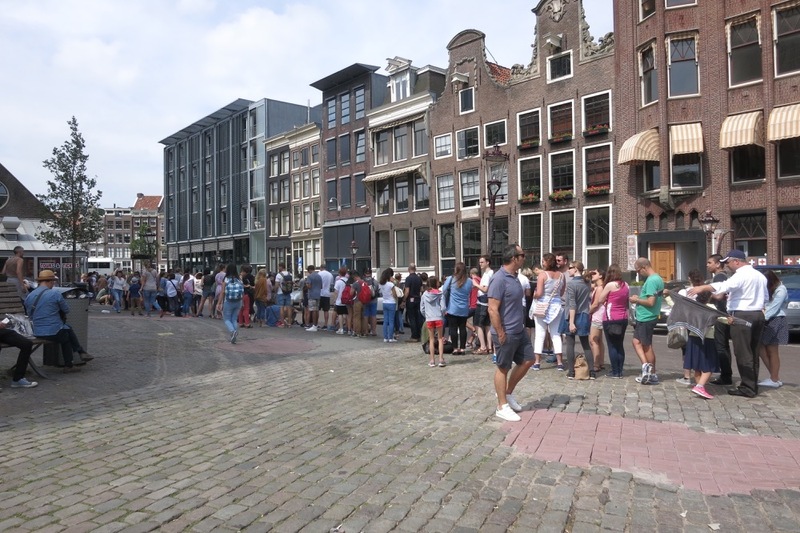 The Anne Frank House is worth experiencing, but as you noted – very crowded! The Corrie Ten Boom House (in Haarlem) is a much smaller operation, but run by lovely volunteers with a great message to share. Food-wise, I love stroopwafels (pro tip: rest them on top of a steaming mug of coffee/hot chocolate to soften a bit). The Dutch are crazy for licorice (“drop”). It comes in both salted and sweet varieties. The salted is…not for everyone. But I like checking out the different shapes/varieties of the sweet licorice. It’s too bad you missed the Anne Frank house. I think the girls would have really appreciated it… had the lines not been THAT long! I know, believe me. I’m really mad at myself — especially since everyone told us we had to order months in advance and somehow we just forgot. Hi Jenny – your friendly Instagram follower here. So glad my suggestions worked out for you! 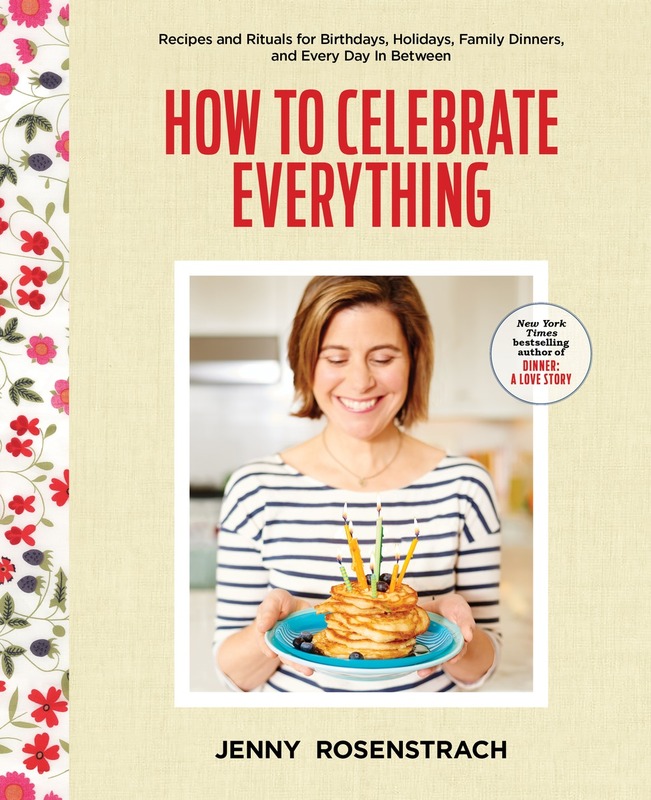 I love your cookbook and your blog and when I saw you were in my lovely city I just had to comment. I’ve lived here for ten years now and it’s the best place I have ever lived. 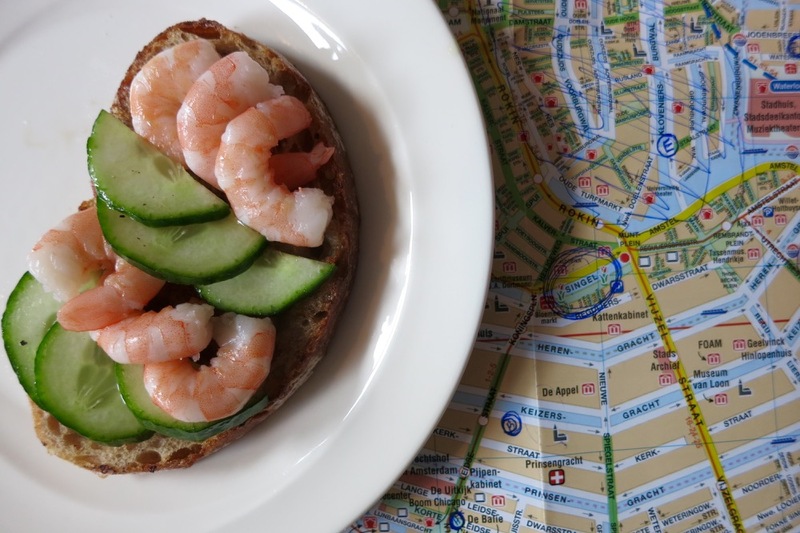 From this post I can see you hit a lot of the Dutch favorites – especially those tiny grey shrimp (Noordzee garnalen), those are indeed SO delicious! 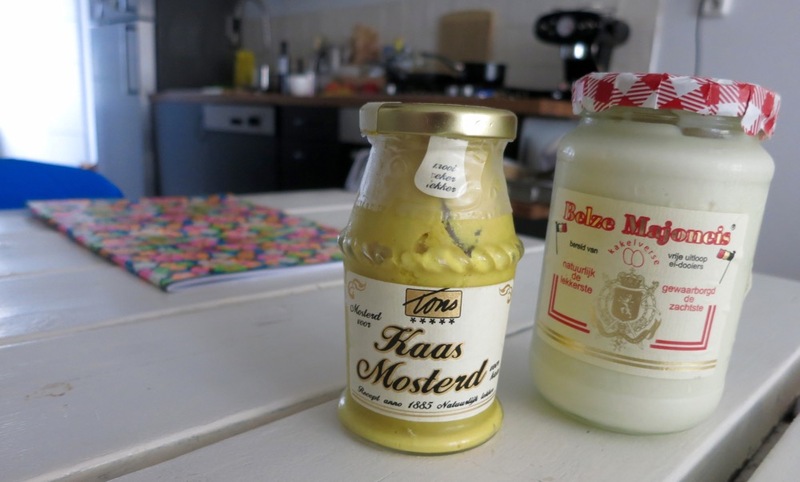 I think I forgot to point you to trying haring (dutch herring)… but you will just have to come back again eh? Greetings from Amsterdam! What an amazing tip, thank you so much. And thanks again for all your help. We really loved your suggestions…especially Cafe Pllek, which we wouldn’t have EVER found on our own. THANK YOU THANK YOU THANK YOU. 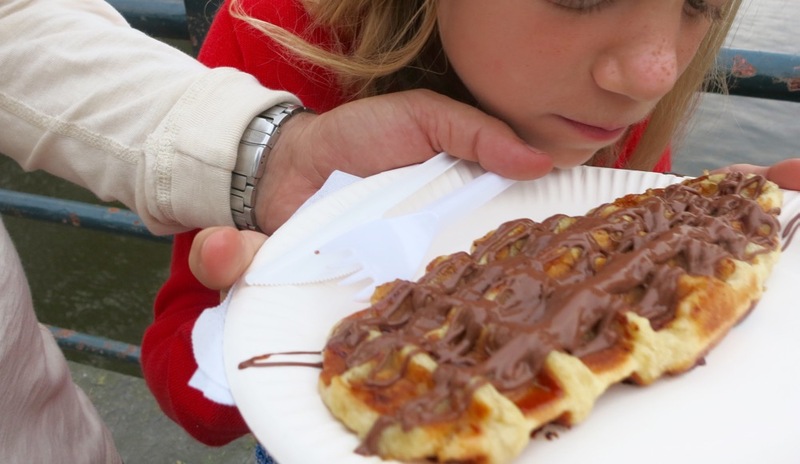 Love the freckles in the nutella waffles photo! Now that our boys are teens we only ever stay in Airbnb or VRBO rentals, because having a home kitchen while on vacation is essential. Our budget – no matter how big – could never afford to keep them well fed if we had to eat out the entire trip because everything you’ve ever heard about how much teenage boys eat is completely true! Looks like a wonderful trip – thanks for sharing. 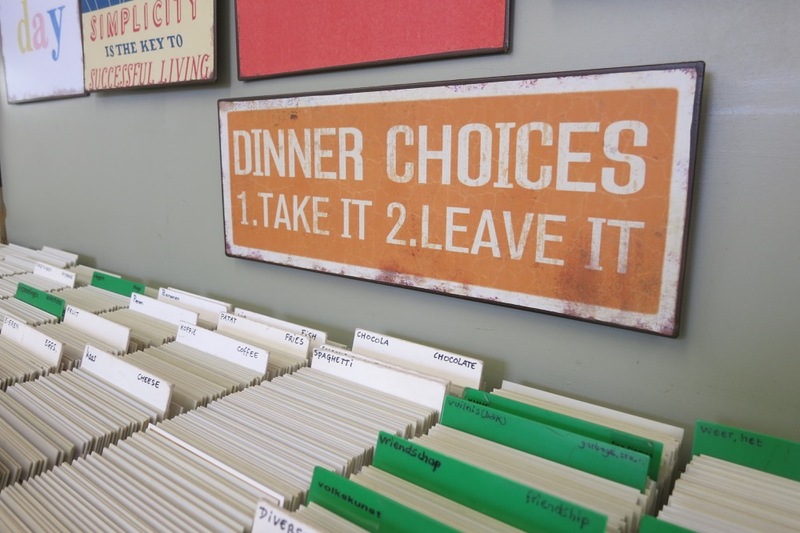 Thank you for the pic of the dinner choices…. its brilliant, I love it. Will be printing and posting on my fridge! All your pics are great by the way, really enjoyed your post! De Kas should be on your restaurant list for next time. And maybe a Pure Markt (artisanal food market on Sunday in various different parks depending on the week). Also, you seem to have crossed off an excessive portion of Centrum if your goal was only to avoid the Red Light District. It isn’t that extensive. I have been to Ibericus before! Yeay! Where was this post about 6 months ago when I was planning my trip!!?? 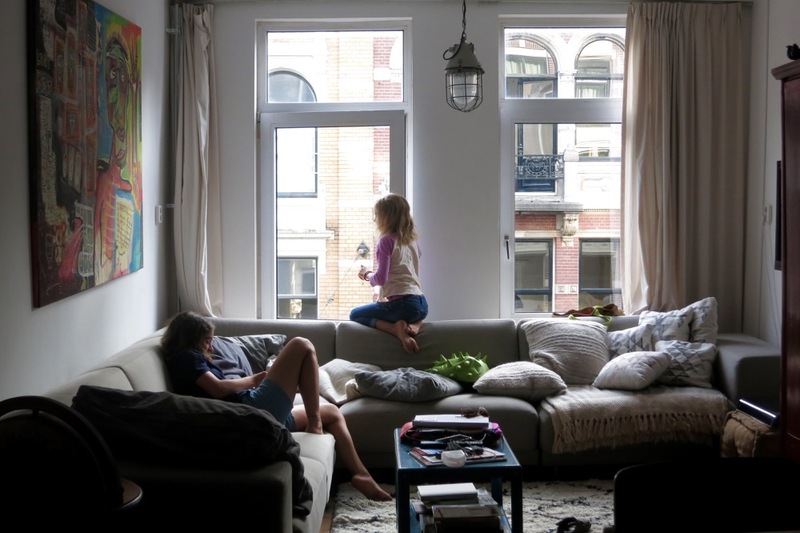 I second renting a flat – we (me +2 friends on a girls trip) did that through City Apartments and it was WONDERFUL for all the reasons you listed, plus reliable wifi. The best nights were the ones where we would go and do all day, then get a to go pizza and a salad and come home and share pictures and recall highlights of the day. I would highly recommend staying outside the city’s center – near one of the other 2 major train stations. We were on the West side of Vondelpark and loved the respite of strolling through the park everyday when the hustle and bustle got to us. Great post, thanks! 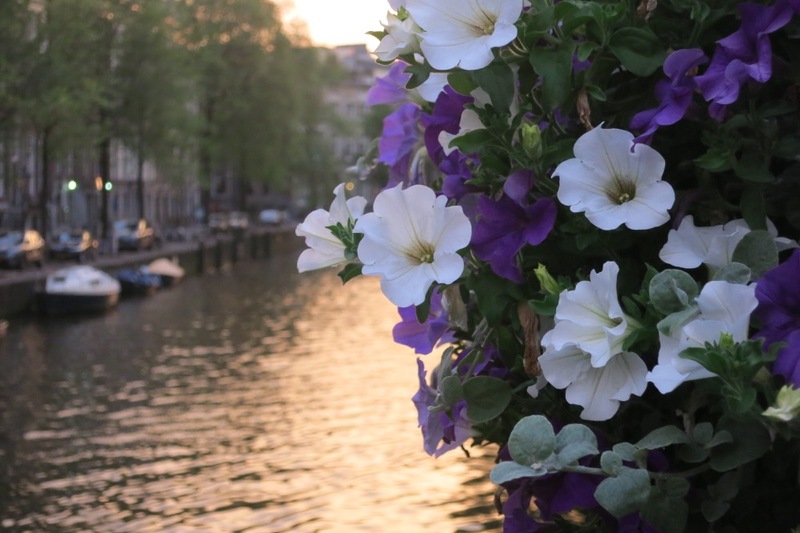 I loved Amsterdam – in fact it is the one place (so far) that I truly think I could live in. I can’t wait to go back! Would you mind posting a link to the house you stayed in? I keep collecting recommendations for places I want to go, or go back to, and it would be great to have since you loved it so much! What beautiful photos! Makes me know it is time to visit Amsterdam! what a fun trip!!! looks amazing. that apple cake, omg. and i love your description of staying in an airbnb. that is always a great moment. Nice photos and foods! I love Amsterdam. This gonna be a useful tips when I pay my visit to there one day. thanks for sharing. The way you described your Amsterdam adventures is exactly what my husband and I have planned in Boston next weekend. Walking and exploring lots stopping to taste and browse and sit and drink and talk. I have done very little planning so decided to turn to y’all (born and raised in Richmond, VA so yes…y’all). We are staying in Beacon Hill. Where should we eat? Thank you. That biking picture of Abby (right?) in the park on your Haarlem trip should be framed. Stat. Amazing! If you go back, check the villages and outlying areas, too. We visited family in Binglerade, which is way south in the Limberg area between Germany and Belgium. I learned about white asparagus and amazing potatoes that you don’t need to butter. In the village, a big grocery on wheels comes twice a week. It has a dozen kinds of cheese and wine, and vegetables. We biked to neighboring towns on market day. One town specialized in textiles (sheets, table cloths, etc.) and one specialized in meats including all sorts of sausages. We took the train to follow bicycle road races! 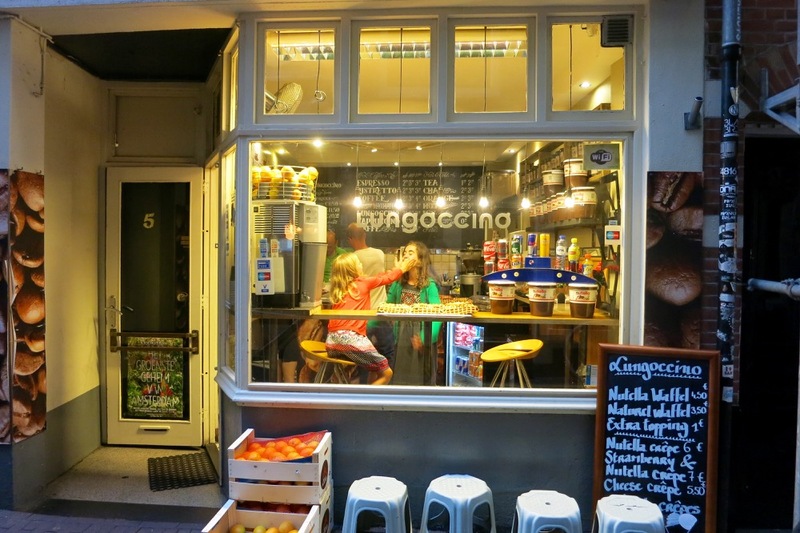 Abaraxas is a killer “coffeeshop”. 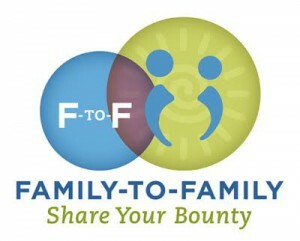 Def worth one parent going in while the other distracts the kids to grab a few goodies for after the kids go to bed. Just back from a weekend in Amsterdam and loved it! It is, as you say, a fairy tale city. 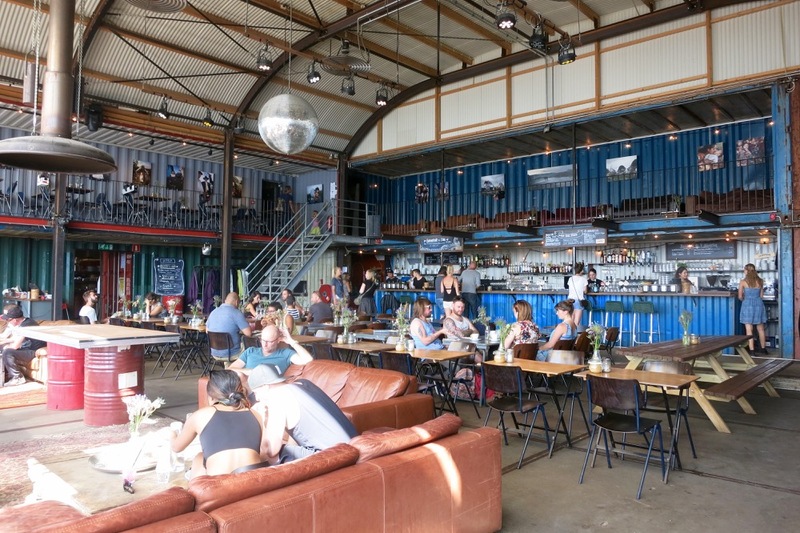 I would add Foodhallen to the list, it’s at Bellamyplein 51 in Kinkurbuurt and was near our Air B n B. It’s a bunch of food stands housed in a renovated industrial building. Hi, could you please post a link to your loft rental? It looks perfect for our family of 4. Thanks!